เธอได้รับการศึกษาที่โรงเรียน Rayne North ในอเบอร์ดีน และโรงเรียนเอกชน Millfield ในตำบล Street ซัมเมอร์เซต  ก่อนที่จะใช้เวลาสามปีที่ LAMDA (London Academy of Music and Dramatic Art). ในปี 2012 เลสลีรับบทของภาพยนตร์ดัง ซีรีส์ Game of Thrones ของ HBO  การเล่นบทของ Ygritte ในซีซีน 2 -4 ได้เสียงตอบรับอย่างท่วมท้น นักวิจารณ์ Rowan Kaiser ของ The A.V. Club กล่าวว่า "Ygritte [เลสลี] ทั้งอันตรายทั้งเจ้าชู้ ทำให้สนุกกับการดู" David Crow แห่ง Den of Geek กล่าวว่า "ตัวละครที่มีความซับซ้อน [... ] โรส เลสลี จะกลืนกินหน้าจอ" ในปี 2013 Todd VanDerWerff นิตยสาร Vox.com เขียนรีวิว ตอน "The Climb" ว่า "(ในหนังสือ) Ygritte เป็นตัวละครที่จะถึงจุดสิ้นสุด ... (แต่) บนจอ เลสลี, เธอกลายเป็นอะไรที่มากล้นเหลือ" Christopher Orr แห่งนิตยสาร The Atlantic สรุปบทบาทของเธอในตอน "The Watchers of the Wall" ที่เผยแพร่ในปี 2014 ว่า "โรส เลสลีเป็นหนึ่งในนักแสดงที่เต็มที่กับการแสดง สามารถยกระดับตัวละครเหนือกว่าสิ่งที่[เล่าเรื่อง]อยู่ในหนังสือ"
เลสลีมีความชำนาญในภาษาฝรั่งเศส เคยอยู่ในฝรั่งเศส 3 ปี ในขณะที่ทำงานการแสดง เธอพักที่เมือง Battersea ลอนดอน ก่อนย้ายไปอยู่ที่ North London บ่อยครั้งที่เธอคิดถึงบ้านเกิด เธอกล่าวว่า "อเบอร์ดีน ... ในใจกลางเมืองชนบท ทั้งหมดเป็นต้นไม้และธรรมชาติ,... ฉันรู้สึกสงบมากในสกอตแลนด์". เลสลีเป็นนักวิ่ง และชอบปีนหน้าผา ทำอาหาร, เล่นสกี ยิงธนู และเทนนิส. Lena Holgate ITV ตอน: "The Ghost Position"
Niagra Donaldson BBC One ตอน: "Custody of the Pumpkin"
↑ 1.0 1.1 "Rose Leslie – Hamilton Hodell – CV". www.hamiltonhodell.co.uk. สืบค้นเมื่อ 17 February 2016. ↑ "Rose Leslie". TVGuide.com. Archived from the original on 13 September 2015. สืบค้นเมื่อ 4 April 2016. ↑ "Downton Abbey web-site". Downtonabbey.com. สืบค้นเมื่อ 17 May 2012. ↑ McDonald, Toby (12 October 2011). "Downton Abbey maid Rose Leslie grew up a Scottish castle Lady". Daily Record. สืบค้นเมื่อ 11 December 2012. ↑ Smith, Emma. "Aberdeenshire castle where Game of Thrones star Rose Leslie was born is put on the market for £1.3 million". สืบค้นเมื่อ 20 February 2016. ↑ Leslie, Sebastian. "Warthill Castle". About Scotland. Archived from the original on 24 November 2012. สืบค้นเมื่อ 11 December 2012. ↑ "Clan Leslie, Aberdeenshire Council". Aberdeenshire Council. Archived from the original on 4 October 2013. สืบค้นเมื่อ 11 December 2012. ↑ "Obituary Jillian Ada Burcher". Newsletter of Clan Leslie Society of Australia and New Zealand, CLANZ. December 2009. สืบค้นเมื่อ 11 December 2012. ↑ Atwood, Margaret (22 March 2015). "Margaret Atwood on Game of Thrones: 'Real people, every murderous one'". The Guardian. สืบค้นเมื่อ 8 January 2017. ↑ "Old Millfieldian Society". Omsociety.com. สืบค้นเมื่อ 17 May 2012. ↑ "Rose Leslie" (PDF). London Academy of Music and Dramatic Art. 17 July 2011. Archived from the original (PDF) on 17 July 2011. สืบค้นเมื่อ 13 August 2015. ↑ 13.0 13.1 "New Talent Awards in 2009". The BAFTA site: Scotland. British Academy of Film and Television Arts. ↑ "Awards and Nominations". LAMDA. The London Academy of Music and Dramatic Art. Archived from the original on 29 October 2012. ↑ "Review of Nell Leyshon's Bedlam at the Shakespeare Globe Theatre in London 2010". สืบค้นเมื่อ 15 February 2016. ↑ "Rose Leslie CV". Hamilton Hodell. สืบค้นเมื่อ 7 December 2011. ↑ Charliebrown (20 July 2010). "Downton Abbey – Rose Leslie". Enchanted Serenity of Period Films. Ottawa, Canada: Blogger.com. ↑ "Bedlam, Globe Theatre, review". สืบค้นเมื่อ 15 February 2016. ↑ "Case Histories, Series 1, Case Histories – Part 1". BBC. สืบค้นเมื่อ 14 July 2015. ↑ "Cast and Credits". PBS. สืบค้นเมื่อ 14 July 2015. ↑ "Rose Leslie: 'It was hard to say goodbye to Ygritte'". The Guardian. 11 January 2015. สืบค้นเมื่อ 14 July 2015. ↑ Rowan Kaiser. "GAME OF THRONES RECAP 6: THE OLD GODS AND THE NEW". สืบค้นเมื่อ 15 February 2016. ↑ "Game of Thrones: The Watchers On The Wall Review". สืบค้นเมื่อ 20 February 2016. ↑ "Game of Thrones (experts): "The Climb" (for experts)". สืบค้นเมื่อ 20 February 2016. ↑ Sullivan, Spencer Kornhaber, Christopher Orr, and Amy. "The One Disappointing Thing About That Huge Game of Thrones Battle". The Atlantic (in อังกฤษ). สืบค้นเมื่อ 15 February 2016. ↑ "Now Is Good (2012) – Cast, Crew & Credits". Moviefone. สืบค้นเมื่อ 14 July 2015. ↑ "'Vera,' ตอน 5: 'The Ghost Position'". KCET. สืบค้นเมื่อ 14 July 2015. ↑ Jeffery, Morgan (16 October 2013). "'Game of Thrones' star Rose Leslie joins 'Utopia' series 2". Digital Spy. สืบค้นเมื่อ 1 December 2013. ↑ "Blandings, Series 2, Custody of the Pumpkin". BBC. สืบค้นเมื่อ 14 July 2015. ↑ "ITV casting announcement of The Great Fire". ITV Press Centre. 4 March 2014. สืบค้นเมื่อ 24 March 2014. ↑ "Rose Leslie's 'Honeymoon' turns horrible in new clip". Entertainment Weekly. 12 September 2014. สืบค้นเมื่อ 14 July 2015. ↑ "Luther series 4 ตอน 2 review". สืบค้นเมื่อ 15 February 2016. ↑ "Vin Diesel's Bushy 'The Last Witch Hunter' Beard". Bloody Disgusting. 4 March 2014. สืบค้นเมื่อ 24 March 2014. ↑ Mr. Disgusting (6 August 2015). "New 'The Last Witch Hunter' Trailer Pits Vin Diesel in the Middle of a Witch War!". Bloody Disgusting. สืบค้นเมื่อ 13 August 2015. ↑ Lesnick, Silas (4 June 2014). "Sticky Notes Adds Rose Leslie, Justin Bartha and Gina Rodriguez". ComingSoon.net. สืบค้นเมื่อ 13 August 2015. ↑ "New Echo Trailer From Ultra Ultra Finally Reveals Voice Actor". สืบค้นเมื่อ 24 September 2017. ↑ "Interview: Rose Leslie, from Wildling warrior to London detective". The Scotsman. สืบค้นเมื่อ 15 February 2016. ↑ "'Game of Thrones' Co-Stars Kit Harington and Rose Leslie Make Red Carpet Debut as a Couple". Entertainment Tonight. สืบค้นเมื่อ 11 May 2016. ↑ "Game of Thrones' Kit Harington and Rose Leslie Share Serious PDA During L.A. Shopping Trip". PEOPLE.com. สืบค้นเมื่อ 11 May 2016. ↑ "Game of Thrones stars Kit Harington and Rose Leslie to wed". BBC. 27 September 2017. สืบค้นเมื่อ 27 September 2017. ↑ Low, Valentine (27 September 2017). "Game of Thrones stars Kit Harington and Rose Leslie to marry". The Times. ISSN 0140-0460. สืบค้นเมื่อ 30 September 2017. ↑ "Game of Thrones wedding date announced". BBC News (in อังกฤษ). 25 May 2018. สืบค้นเมื่อ 25 May 2018. ↑ "DATE WITH KATE: ROSE LESLIE". Kate Waterhouse. สืบค้นเมื่อ 16 February 2016. ↑ Getell, Oliver (24 May 2016). "First look at Kate Mara in Luke Scott's sci-fi thriller Morgan". Entertainment Weekly. สืบค้นเมื่อ 12 October 2016. 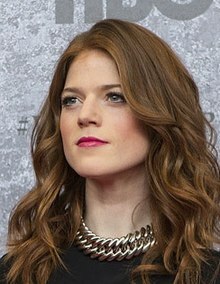 ↑ "Rose Leslie Body Measurements Bra Size Height Weight Shoe Vital Statistics". Celebrityinside. สืบค้นเมื่อ 12 October 2016. ↑ Nellie Andreeva (12 October 2016). "'The Good Wife': Rose Leslie Cast In Spinoff Series For CBS All Access". สืบค้นเมื่อ 12 October 2016. ↑ "SAG Awards Nominations: '12 Years A Slave' and 'Breaking Bad' Lead Way". Deadline Hollywood. 11 December 2013. สืบค้นเมื่อ 11 December 2013. หน้านี้แก้ไขล่าสุดเมื่อวันที่ 5 กรกฎาคม 2561 เวลา 02:31 น.